Preparedness is great. With everything bearing down on us about now--it's going to save lives. No further debate required. BUT ... where there remains differences of opinion is in how much cooperation with neighbors, friends, family should be in the master plan. For me--there is NO question. In a true emergency, America will stand or fall based on its ability to pull together into communities, large and small. Most any emergency can in some way be compared to war. Contrary to what is portrayed on the big screen, Rambos do not last long going solo in a war zone. When the chips are down, we all need a little help from our friends. You've seen the headlines about the burgeoning pandemic threat coming out of Mexico. The CDC says it's too late to contain it. I'll tell you how I'm ready ... with a product that makes hospital-grade sense, that's how. I don't know if we're looking at quarantines in this outbreak or if this is the big one we've been warned about. But I know that if I need to disinfect any surface or area quickly and effectively--the HAZARiD Decontamination kit is going to get it done. A coming "summer of rage" has been forecast in various quarters as being almost inevitable. Europe especially is seen as being vulnerable to the conditions on the street brought about by the global economic crisis. Governments around the world are closing ranks and throwing unprecedented volumes of taxpayer monies into what many see as institutional sinkholes. Most acutely, jobs are being vaporized by the millions. No one anywhere is feeling secure today. Mental stability across social strata is crumbling where personal stresses reach criticality. Outbursts of tragic violence and brutality are beginning already to dominate headlines. The most heart-rending stories are of course those where the young and innocent are victims. Social crises such as what are materializing today are historically the periods when governments enact permanent measures that would never otherwise be broadly considered. That is not to say that there are not strong pockets of opposition. Patience, compassion, and the will to coexist among competing interests vanish when urgency is motivating decision-makers. Frustration and anger erupt easily among those feeling wronged. Expectations for discord are clearly high elsewhere, but in America we too are seeing conditions mushroom that are conducive to widespread protest actions. Homeland Security and other law enforcement agencies are on the alert and they say they are prepared to deal with it. How it all plays out is anyone's guess. But it is safe to say that 2009 will not go down in the books as a summer of love. Be smart ... get ready seriously. WASHINGTON -- According to the U.S. government, I am an extremist. I am a Christian and meet regularly with other Christians to study God's word. My faith convinces me the prophecies in the Holy Bible are true. I believe in the sanctity of human life, oppose abortion, and want to preserve marriage as the union of a man and a woman. I am a veteran with skills and knowledge derived from military training and combat. I own several firearms, and I frequently shoot them, buy ammunition, and consider efforts to infringe on my Second Amendment rights to be wrong and unconstitutional. I fervently support the sovereignty of the United States, and I am deeply concerned about our economy, increasingly higher taxes, illegal immigration, soaring unemployment, and actions by our government that will bury my children beneath a mountain of debt. Apparently, all this makes me a "rightwing extremist." At least, that's what it says in the April 7 "Assessment" issued by the Office of Intelligence and Analysis at the Department of Homeland Security. The nine-page report, titled "Rightwing Extremism: Current Economic and Political Climate Fueling Resurgence in Radicalization and Recruitment," is full of warnings about American citizens who share any part of my background or subscribe to the beliefs above. It is one of the most alarming documents produced by our government that I ever have read. Evidently, neither you nor I ever was supposed to read this "Assessment." At the bottom of the cover page is a warning that it is "not to be released to the public, the media, or other personnel who do not have a valid need-to-know." We're Americans. We have a need to know what's going on in our government, especially in an administration that promised to be "transparent." A full copy of the report is posted at http://www.FreedomAlliance.org. The "Assessment" purports to alert law enforcement officials that "rightwing extremists" -- the term is used more than 35 times -- are intent on exploiting Americans who have strongly held beliefs on everything from Christian faith to rising unemployment, U.S. sovereignty and the Second Amendment. It vilifies those of us in these categories by references to neo-Nazis, racists, militias, white supremacists and other "hate groups." Notably, the report includes a warning that right-wing extremism "may include groups and individuals that are dedicated to a single issue, such as opposition to abortion or immigration." Though the report proffers a passing reference to the First Amendment, it is replete with bias against conservative thought, writing and communications. On Page 3, law enforcement authorities are warned, "Rightwing extremist chatter on the Internet continues to focus on the economy, the perceived (emphasis added) loss of U.S. jobs in the manufacturing and construction sectors, and home foreclosures." That is a frightening acknowledgment that political speech is being monitored in America. It is also wrong. It's not "perception." It is fact. According to the Bureau of Labor Statistics, the manufacturing and construction sectors have lost 161,000 jobs and 126,000 jobs, respectively, last month alone. In its "Key Findings," the DHS manuscript boldly charges that "rightwing extremists may be gaining new recruits by playing on their fears about several emergent issues" and offers this warning: "The possible passage of new restrictions on firearms and the return of military veterans facing significant challenges reintegrating into their communities could lead to the potential emergence of terrorist groups or lone wolf extremists capable of carrying out violent attacks." Under the heading "Disgruntled Military Veterans," the report alleges: "Rightwing extremists will attempt to recruit and radicalize returning veterans in order to exploit their skills and knowledge derived from military training and combat. These skills and knowledge have the potential to boost the capabilities of extremists -- including lone wolves or small terrorist cells -- to carry out violence." These unsubstantiated claims are followed by reminders that Timothy McVeigh, who bombed the Oklahoma City federal building in 1995, was a military veteran. Omitted is any reference to the fact that McVeigh was simply one of more than 40 million veterans of the U.S. armed forces. Thirteen lines after this egregious, unconscionable slander against those of us who are military combat veterans, DHS makes the stunning charge that "lone wolves and small terrorist cells embracing violent rightwing extremist ideology are the most dangerous domestic terrorism threat in the United States." According to this DHS "Assessment," the most dangerous threat we face here at home isn't from radical imams preaching violence in U.S. mosques and madrassas, Islamists recruiting in our prisons, Somali terrorists enticing young immigrants to become suicide bombers, or Hamas, Hezbollah or al-Qaida operatives plotting mass murder. No, according to DHS, the real threat comes from what our government labels "rightwing extremist ideology." Mr. Obama should disavow this report publicly and fire the officials responsible for issuing it. Those who prepare his remarks for the occasion should insert in the teleprompter former Sen. Barry Goldwater's words on the subject: "Extremism in the defense of liberty is no vice." Robust, self-contained, portable solar backup systems have been designed and introduced into the consumer marketplace by Green Duck Energy Solutions. The Viking solar backup product line is distributed by Safecastle LLC. MINNEAPOLIS – At a time when the U.S. power grid is shown to be increasingly vulnerable, Safecastle LLC and Green Duck Energy Solutions, Inc. are pleased to be introducing a new line of portable, self-contained, solar backup power systems, sized and priced to accommodate most consumer budgets. The Viking Backup product line has been designed specifically with the crisis preparedness and outdoor adventure marketplaces in mind. 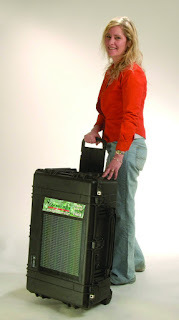 Robust hard cases contain complete, ready-to-deploy solar backup systems that include foldable solar panels, charge controllers, inverters, AC and DC outlets, cabling, and sealed lead acid batteries. Safecastle LLC is an established crisis preparedness provider specializing in steel-plate shelters and safe rooms, emergency storage food, supplies, and gear of the highest quality and standards. The company offers a buyers club for those interested in an economical, reliable approach to emergency readiness. Green Duck Energy Solutions is a leader in the design and implementation of energy solutions using thin film solar and wind turbine technologies. This video was captured from an insurgent. It shows how we fire artillery on a rockets nest they used to attack an army base. Recurrent natural disasters, man-made catastrophies, and economic turmoil across the globe make the need for personal preparedness an absolute necessity today. Government, relief agencies, and the very system that the global economy depends on are all at risk of failure. Safecastle LLC is committed, along with others, to improving the readiness of Americans in the face of developing economic and geopolitical chaos. Minneapolis (Vocus/PRWEB ) April 2, 2009 -- For many, emergency preparedness is a way of life. It’s a logical approach to having insurance set aside, just in case the worst comes to pass. Yet in recent years, “survivalism” came to be portrayed as a fringe, even dangerous avocation. The label “survivalist” became a slur of sorts. If there was one thing that was certain in the late 20th century, it was that you didn’t want to find yourself living next door to a bunch of survivalists. Dangerous realities continue to surface in the 21st century. Clearly, our world has not been tamed. Natural threats to personal safety are ever-present and often unpredictable. But man-made danger to our comfortable way of life is growing fast and obviously bearing down on us. Today, we are afforded the perspective of watching the unfolding global economic catastrophe in our choice of real-time media,’ said Rantala. At Safecastle, all of our preparedness-related businesses are at full capacity, responding to the demands of those who are just now coming to the table. We fear time may be short to adequately prepare America for what is coming, but we remain committed to doing everything we can.